Been awhile since I wrote a race report, so I figured since the racing season is just about over, it's past time. First, an addendum to last season - about a week after I finished my second half marathon, I read about this guy named Martin Rees. The guy is a friggin' beast. He's over 60 but still runs a 71 minute half marathon, one of many world records he holds in his age group. I wouldn't be surprised if he has all the age group world records from 1500m through marathon within a year or two (if he doesn't already). Anyway, I'm inspired when I hear about people getting super good at something they started later in life, so I read that article, got pumped up, and less than a week after my second half marathon, stupidly went out for a long run (~9-10 miles). With less than a km till I was home, all of a sudden, my left knee really started hurting, enough to make me stop running immediately and limp home. The next day, walking was very painful. I completely stopped running in order to let the knee heal, but after three or four weeks or so, it just wasn't getting any better. After a great deal of research, I decided that the cause of the pain was a serious muscle imbalance, and since resting doesn't fix entrenched muscle imbalances, that's why the knee wasn't improving. For background, ever since I first set foot in Asia seven years ago, people have made fun of the way I walk. It's strange how some things are noticeable immediately to Asians but not to Westerners. Specifically, every Asian culture I've encountered has told me in some slightly different way that I walk like a duck. That is, feet pointed outward. I always just thought everyone walked differently, and that happened to be the way that I walked. But the more I looked into it, the more I realized that there was a reason I walked that way, and biomechanically, it's totally incorrect. Basically, duck feet are often caused by inactive glutes, along with other muscle imbalances. This is most likely the same reason my squat kept maxing out at a relatively low weight - I was overusing my quads, which are small muscles, and not using my glutes, which are huge, powerful muscles. If you develop this muscle imbalance long enough (like, my whole life), then you end up with what's called an anterior pelvic tilt, which causes all sorts of terrible posture problems and also sets you up for injury when you run. 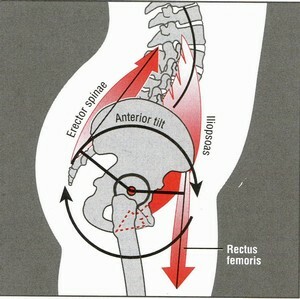 Anterior pelvic tilt. Good for showing off the booty, but not much else. So I decided I needed to fix this muscle imbalance before I got back to serious running. Basically as soon as I started focusing on working my glutes, my left knee started getting better. Ironically, my right knee started hurting quite a bit. But finally after a few months of dedicated work, both knees started feeling quite good, better than before, and I was able to get back to running again. The problem is not fixed - I looked back at footprints I left in the sand last month as I mindlessly walked along the beach, and was appalled to see the veritable duck prints trailing behind me - but it's much better than it was before, and I feel like I have a more solid base to work from now. I also notice duck walkers everywhere I go these days. Enough of that for now. Onto the races! 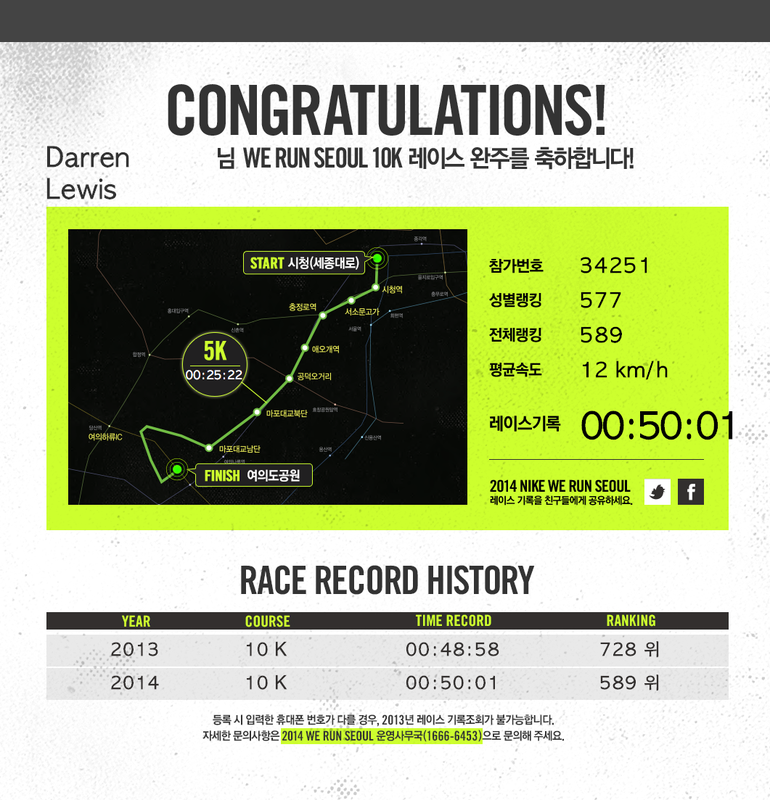 Last year, We Run Seoul was my first ever 10K, which I ran after a few months of Maffetone aerobic training and was more than pleasantly surprised to run in 48:58. This year, I came down with a serious cold, one of my first of the year, a week or two before the race. It was one of those annoying upper respiratory coughing colds, and I thought I might have to skip the race, but it was good enough by race day that I decided to run, despite doing very little running in the weeks leading up to the race. The race was crazy, chaotic, packed with people (about 30,000, I think). Having not done any speedwork, I actually felt like I was running fast, but when I crossed the 5K point at 25 minutes, I realized it was not going to be a great time. I finished in 50:01, which means I actually got slower over the last year. But it was fun, because it felt like a fast pace to me, and a 50 minute "base" 10K is not so bad. After We Run Seoul, I really wanted another shot at a 10K before the season ran out, so I signed up for a race over a month out, giving me some time to get ready. At the time, it seemed like a good idea. It was still beautiful fall weather, and I was excited to actually have some time to do a few dedicated workouts before the race. Fast forward to the race, this past Sunday. It was 20F (-7C). Not only was it the coldest weather I've ever raced in, it was literally the coldest weather I've ever attempted running in. It's weird gearing up for a race wearing long pants, long sleeve shirt, light jacket, hat, and gloves. I ran around for 10-15 minutes before the gun, but just couldn't warm up at all. In fact, it took until somewhere between 1 and 2 km to be able to completely feel my feet. I also decided that for the first time since getting my heart rate monitor, I would run with the GPS watch but without the heart rate strap, instead relying on "feel". The great thing about heart rate training is also the worst thing about heart rate training - it's super easy to become addicted to constantly checking your heart rate. I was worried that going by feel without any training was a bad idea (you're not supposed to try anything new on race day), but I gave it a shot anyway. 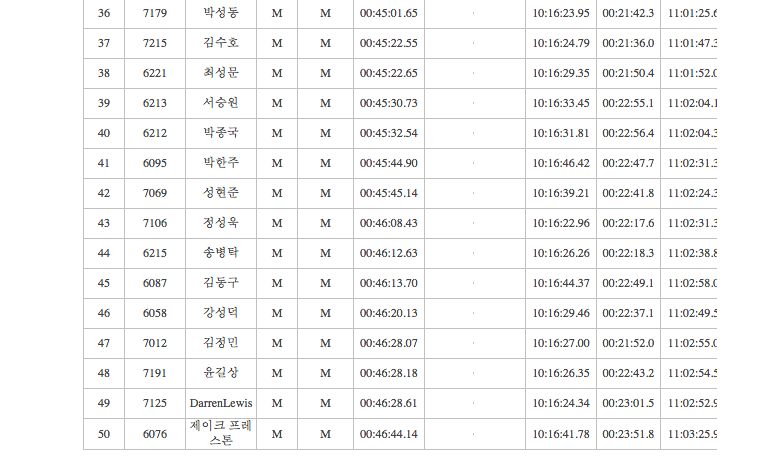 The first mile came in at 7:15, way faster than the 8 minute pace from We Run Seoul. I slowed it down a bit the second mile (~7:45), because I was worried I had gone out too fast and was going to die of a side stitch before the halfway point, but I settled into a nice pace around 7:35, and felt pretty good, so kept going. At the turnaround, I looked down and saw 23:30 on my watch, which had me at PR pace. I picked it up slightly in the second half, and really started pushing in the last mile, and when I came out of the tunnel and into the stadium (the race started and ended in one of the stadiums from the '88 Olympics), I knew it was going to be good. I looked down before the final bend and saw I was at 46:10, and kicked as hard as I could to the finish, crossing in 46:28:61! A full three and a half minutes better than the previous race, and 45 seconds better than my prior best. All in all, a great race, and a great way to end the season. I like the shorter distances (5K, 10K), and will probably stick to those unless I get my mileage high enough to justify doing a half marathon. I like the feeling of moving fast, and 10K is a short enough distance that you feel like you're moving for sure. I actually really enjoy sprinting, too, and will probably throw in some sprint workouts for fun, but I have no idea if I can actually get official timings in sprint distances. But even more important than the races, which are just arbitrary milestones that don't mean anything to anyone other than myself, it feels kinda awesome to be able to quickly cover the amount of ground that I can nowadays. The week before the race, I managed to complete my first "easy" run (i.e., average heart rate 147 bpm) 10K in under an hour, including warming up and some walking. When I started this whole thing a year and a half ago, I couldn't have imagined racing a 10K in less than an hour, let alone lightly jogging one. And during the race over the weekend, as I was flying next to the river on a brisk winter morning, I thought to myself, "Man, I feel like a better human now that I can run 6 miles in 45 minutes." Weren't we meant to be able to move quickly across the landscape? And as I returned my thoughts back to the modern era and headed down into the subway after the race, I realized that if I really needed to run another 10K right at that moment, I could do it. It would be painful, but I would survive. Just on my own, without water or fuel, wearing light clothes, I could totally run back in less than an hour. And that made me feel nice and warm and forget about my muscles already starting to get sore.